American soprano, Sydney Kucine, brings the highest caliber of vocal technique and musicality to each performance, captivating audiences around the world. 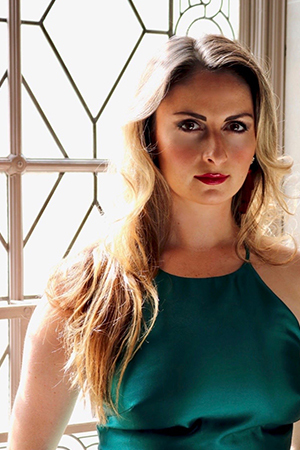 In the 2019 season, Ms. Kucine makes her professional debut with Sarasota Opera as an Apprentice Artist. She is covering Papagena in their main stage production of Die Zauberflöte. Additionally, this summer she performs Helena in A Midsummer Night’s Dream (Chautauqua). She makes her professional New York City debut, singing the role of Micaëla in La Tragedie de Carmen (City Lyric Opera). As a young artist, Ms. Kucine has studied and performed the roles of Micaëla in Carmen (Chautauqua), Juliette in Roméo et Juliette (Mannes), Musetta in La Boheme (San Francisco Conservatory), Susanna in Le Nozze di Figaro (Oberlin in Italy), Papagena in Die Zauberflöte (Berlin Opera Academy), Lucia in Lucia di Lammermoor (Mannes), and Fortuna in L’incoronazione di Poppea (Oberlin in Italy). Ms. Kucine is a recipient of numerous awards. Most recently, in 2018 she was an international finalist in the Sigma Alpha Iota Concerto Competition at the Chautauqua Institution. In 2017, she was a semifinalist in the Mondavi Center Competition. At the young age of eighteen, she made her Carnegie Hall debut, and sang in a masterclass presented at the Metropolitan Opera Guild. Ms. Kucine is also a devoted recitalist. She has given solo recitals across the United States, from San Francisco, California to Portland, Maine. Ms. Kucine’s has studied Italian at the Accademia Europea di Firenze, and is fluent in both English and Italian. The soprano holds an undergraduate degree from The San Francisco Conservatory of Music where she studied with Deborah Voigt, and is presently working towards a Master of Music degree at Mannes School of Music at the New School, New York where she is a student of Ruth Falcon.